Chris received his Doctorate of Physical Therapy degree from Louisiana State University – Health Sciences Center in New Orleans, Louisiana. Chris has experience in outpatient orthopedics, inpatient rehabilitation and acute care. Upon graduation, Chris was inducted into the Alpha Eta National Honor Society for Allied Health Professions for his commitment in the classroom and in the clinic. His particular interests include sports medicine and post-surgical orthopedic cases. Chris places a heavy emphasis on manual therapy techniques and education to help patients reach their individualized goals. 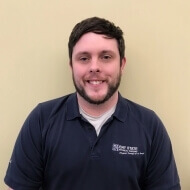 Having recently moved to the area, Chris is excited to experience all that New England has to offer and particularly enjoys the outdoors and sports related activities.